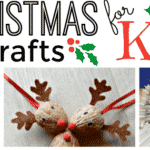 Welcome to Christmas Get Crafty – craft ideas for all the family. From easy, low tech to wonderfully intricate. What will grab your fancy? Once again I am very excited to that it is “Get Crafty” time.. 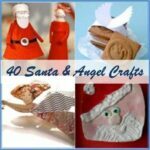 I love seeing what everyone has been up to, as well as find some inspiration for ourselves… Christmas is an especially wonderful time to craft. 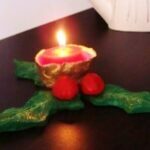 As the afternoons get darker, the weather gets colder and we need to add some Christmas cheer to our homes. I hope you find lots of it here! And don’t forget, there is also a round up just on Santa and Angels! 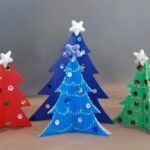 Let’s kick of this Christmas Get Crafty with these lovely little easy Christmas Trees by the wonderful That Artist Woman. 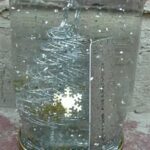 I am a keen reader of her blog, always packed with wonderfully artistic crafts,exploring different techniques and cultures, you will not be disappointed. And here we have her cute and simple trees. Love. Want simple? Want cute? 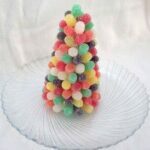 Want something perfect for young hands.. try these Lollipop Stick Trees. Adorable and perfect for preschools. 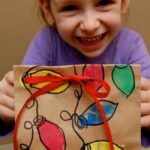 A Homeschool Journey shares her lovely little craft! I think we shall have a go. Red Ted and Pip Squeak will adore them. 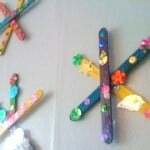 Another lovely craft for lollipop sticks are these cute little stars. Check out Plus 2 Point 4 and see all the different ones they made – colourful and sparkley and fun!! Just perfect. 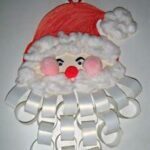 I know we have “Santa & Angel” Get Crafty around the corner… but I had to share this with you NOW, as this is a count down paper chain calender – how adorable is that? Firstly the finished calendar is adorable as it is… and secondly it doubles up as a count down chain. PERFECT. Love it! By Cool Kids Craft. Check it out! Another very favourite site of mine (yes yes, bad grammar, but I am excited) is Skip To My Lou.. I am sure you ALL know Skip To My Lou, and if you don’t – where have you been?! Go change that now… In the meantime, take a look at these cute little Pom Pom decorations. Aren’t they simple cute??? 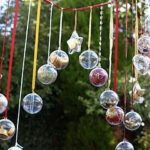 Oh my, I LOVE this bit of crafty recycling – light bulb baubles?! How fun and cute are they? I especially like the oblong ones as they remind me pine cones. The clever lady behind them is Mermaid Creations! 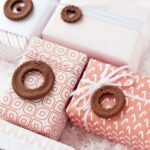 I love love love this festive wrapping paper from Valerie at Frugal Family Blog. She made it with the help of both her girls and I think it looks FABULOUS! She has so many other fantastic ideas on her site, that you really should go and have a good nose around. 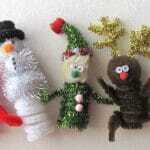 Oooh how cute.. finger puppets made from Pipecleaners! These would be great in the classroom or at home.. make your puppets and put on a show! Lovely. Craft Jr shares their craft! You know that we ADORE Salt Dough.. well if you love Salt Dough, but want to make that little bit more special.. try Cornstarch Ornaments. 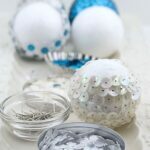 Cornstarch gives your ornament that lovely white colour and smoother finish. Don’t they look wonderful? In fact.. I think we need to go off and make some right now! I’m A Mom Not A Professional shares her post. And here are some that Chris from Thinly Spread made last year. Beautiful! I love Rebecca’s blog. I am not sure what it is – maybe her beautiful photographs? Her adorable children? Her lovely crafts? Or is just that Rebecca herself is such a lovely lovely person? 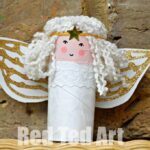 Her character shines through in this “simple is best” craft post for kids – toilet roll Christmas trees. Lovely. Amanda does it again.. Amanda is one of those wonderfully prolific crafters – who you will find in many guises – be it Crafts By Amanda or Family Fun Crafts… or here crafting for Kaboose. 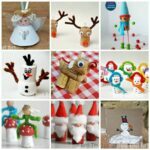 She always comes up with cute, fun adorable and very child friendly crafts. 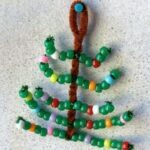 Check out this cute little Bead Tree. Lovely. Or fancy working with the humble Paper Plate? 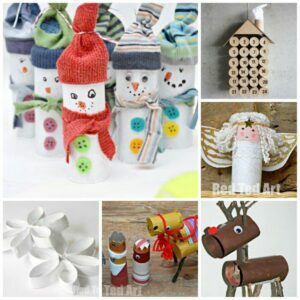 Easy Christmas Crafts, have indeed an easy craft. 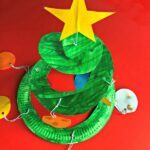 Kids will love making this and it looks cute too! And here she is again, the lovely Amanda crafts here for Kaboose. 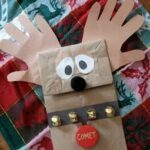 This time combing paper bags with hand prints to make a fun little reindeer craft. 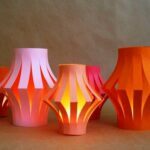 Aaah how sweet is this, get some air drying clay and make these lovely little tea lights a la Fab Mums. Fab indeed! 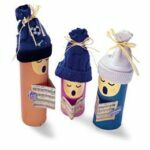 Surely you all know how much I LOVE LOVE LOVE to use loo rolls to craft with.. well here we have some adorable carol singers made from just that.. You could use old socks or fabrics to make the hats. Family Fun shares their craft. 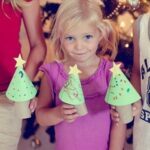 Ooooh I love these little Christmas Tree Place Markers.. not only are they cute and something a little bit different to do for the Christmas crafting season.. but you can let your little ones help you make them. Me and My Shadow shows you how. 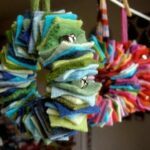 Don’t know about you, but I have a box full of buttons, that I have accumlated over the years.. and finally something to with them – mini button wreathes. Aren’t they simply lovely and cute? I bet kids could help too! 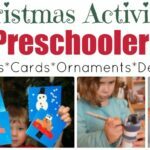 Christmas Crafts came up with this one! 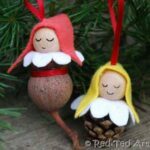 This year’s Christmas decoration on Red Ted Art – our “Baby Elves” – we call them the Australian babies (Gumnuts) and South Park Garden Babies (as we found the pine cones in “South Park Gardens”)… Quick to make and cute! …. 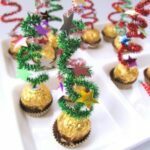 and one of my most popular Christmas posts from last year – the cookie cutter felt ornaments, made with the help of cookie cutters. Again a relatively but pretty craft. Visit last year to see the “how to”. Hope you like it and have a go! Ooooh and aren’t these simply too clever? 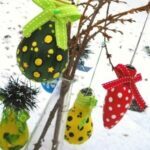 Get some old Paint Chip cards and make beautiful baubles. Gorgeous indeed!!! Curbly shares a how to video to guide you through the steps. Of course you could use other “scrap cards” too… maybe make some out of last year’s Christmas cards? 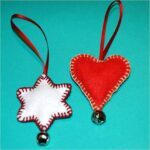 And if you are into ornament making, then I think you will like these little stars. Aren’t they beautiful? You do need “special” star shaped wires, which would put me off a little (as I am not sure how readily available they are).. but I wonder if you could twist four pieces of wire together? What do you think? 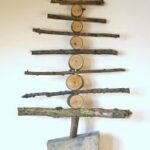 Check out Christmas Projects for their how to. I love these little gift embellishments made from Cinnamon Dough. How gorgouesly festive are they? Love the cinnamon and love the natural simplicity of this craft. Almost too good to eat! Domesti Fluff shares her “recipe”. The Gingerbread House made these wonderful Stick Trees. House it that for some natural and different decor? I can imagine going on a lovely long family walk first, collecting your materials and then getting crafty once home. Perfect. 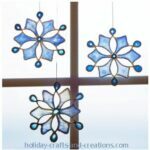 I LOVE these snowflakes.. and you simply must check out how they are made – MUCH easier than you think.. so coo. 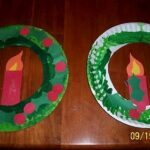 Holiday Crafts and Creations shares their tutorial. What is Christmas without a bit of sparkle or bling? Satisfy your crafty sparke craving with these DIY sequin baubles. Simpls. Papier Valise shares how you make them…. I think these little ornaments are adorable…and I love the fact that they are made from Felt Scraps. I wonder what other the things you could make them out of… check out Betz White for how she went about it! You need to click through on this one to see the info on the calendar – but the photo says it all: sweet, simple, looks great! From Holidash. 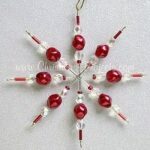 …or another fabulously festive and lovely idea is this Advent Bauble Calendar from Here Come The Girls. Looks so festive and fun. I love it. Such a cute idea. 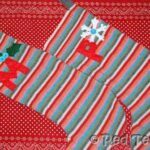 In case you missed the “Christmas in July post” – how about these “no knit” knitted Christmas Stocking? 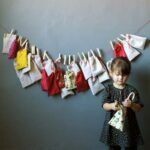 Repurpose and old favourite jumper and make some adorable stockings for all the family (I have made 3 and need to make my one now.. need to find another jumper!!). Love the delicate glow.. these are nice and safe as you have a glass at the centre of the lantern. It is also the glass that allows you to have that two tone glow. Gorgeous. Takes me back to childhood. 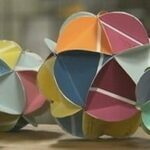 Design Sponge shares their craft with us! Here is a fun take on your “traditional” snowglobe: snowglobe gift cards! What a very fun and quirky idea.. now I don’t know if it works with ALL store cards… but I love it never the less! If in doubt, just make a normal snowglobe and give that as a present as the kids on Frog Goose and Bear have done too! These are simply too cute! Love love love! 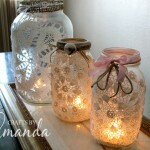 Check out these pretty Winter luminaries and how easy it is to make them! 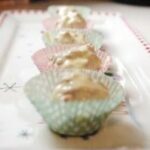 Oooh nom nom nom nom, I am rather particial to Ferrero Rochet.. I could eat them all day long. 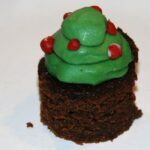 Love how cute these look dress up as little Christmas Trees. 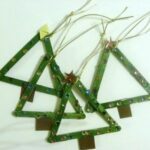 Melissa Goodsell has lots more Christmassy ideas for you.. worth a look! 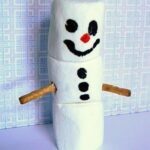 I think we *may* have had Marshmallow Snowmen on Get Crafty before.. but you know what? What is winter and Christmas without one of these fun little guys? A perfect Advent Calendar activity in the countdown to the festivities. Lizard N Ladybug bug share theirs this year! 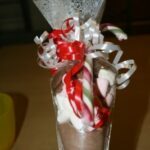 I LOVE the title of this fun frugal gift – snowman soup!! Aaah the poor dear snowman will be consumed… but this frugal gift fro Frugal Family is actually rather nice and delicious – basically a hot cup of cocoa with toppings in a bag! Yum. Here is a three in one post for you from Mummy Mummy Mum… some little decorated cakes and a little “pairs matching game”… now when Emma sent this to me, she was a little “but is it good enough for Get Crafty”? I asked “Did Z have fun”? She said “Yes, lots”? Well… there you go. That is what Get Crafty is all about! And little Z is only 4. And I think the cake looks rather scrummy! Red Ted is already asking whether when the snow will come this year… we don’t always get snow in the UK, so these are just the ticket should we not be “lucky” this year… Domestic Goddesque shares her treat! 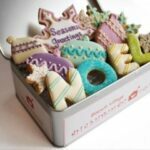 And to finish of this delicious “Christmas in the Kitchen” section, some perfectly iced cookies – again a fab Guest Post from last year on Red Ted Art. Be inspired. 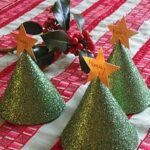 I hope that you liked this year’s Christmas Get Crafty.. don’t forget there are “tons more” Christmas Crafts on the blog, with not just traditional decorations and cookies, but also gifts and stocking fillers. Have a browse of the “Christmas” category on the side bar drop down menu! Aaaaand… here is the fabulous Santa and Angels Craft round up.. so do stay and check out MORE! Such brilliant ideas for this round-up: I have been pinning furiously!! These are super cute ideas. I will definitely be linking back to this over the run up to Christmas. 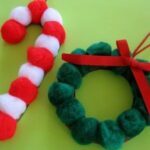 I started my own Christmas craft blog. It’s growing…slowly! I my oh my! Must set aside SEVERAL hours to devour all this lovely lot. Love these ideas! I especially love that adorable advent calendar. On my to do list! Ooh, some lovely ideas here that I think even I could make! Thanks for linking to our snow globes! 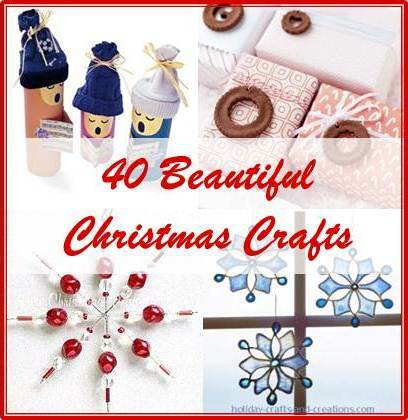 What a great collection of christmas crafts here! I’m bookmarking away! Thanks for having this link page. I found some great ideas! I am your newest follower. Cheers! Thank you so much for posting all the adorable ideas to create with our little ones. It’s going to be a homemade Christmas for us this year from my little ones. You are always so nice to me! Thank you for your kind words Maggy! Thanks for sharing. I’ve been looking for Christmas ideas for my Girl Scout troop. There are so many brilliant ideas here. I think we’ll have a go at the cornstarch ornaments and the singing choir as we all love to sing as a family. Thanks for sharing…I definitely found some to pin to Pinterest!! I know I know… this list is not ALL for making… there wouldn’t be enough time! Hope you have fun and happy pinning! top of the list though has to be those snowflakes, then the stick tree! We LOVE Christmas as well!